In the Ultimates universe, Miles Morales takes on the mantle of Spider-Man after Peter Parker's demise. If you are unfamiliar with the character, you may scour the wiki and absorb all of his history and secrets: Miles Morales is Spider-Man! 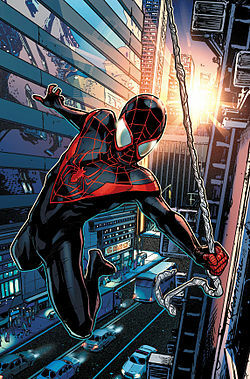 Miles' sports a much simpler black and red costume with the trademark mask and web pattern. It's simplistic look is sharp and in turn presents a good looking figure. Miles is the only figure in The Amazing Spider-Man 6 inch assortment that I care about. He is packaged with one of the figure bases packaged with The Avengers 6 inch line and with Marvel Legends Wave 3. It's origins are based with the Heroscape game. He also is packed with an accessory, a web shield! Not great, but at least it is an accessory. I would rather have had a swingy web like the Spider-Man Movie figure from this line. The paint doesn't wow but it keeps the basic essence of the figure. The most notable fail is the decision to keep the spider pattern on only the upper part of the torso without covering the gap and onto the abs. The character design clearly is a little different and it takes a bit away from the final product. Hasbro did take the time to do a nice looking back pattern. I can't verify if it's proper, but I like it. The articulation doesn't disappoint. It is the typical Marvel Legends style, down to rocker ankles and double jointed everything. The sculpt is not the same used for FF/Big Time Spidie in Marvel Legends wave 2, and Miles is a bit shorter as he should be. All in all, I am happy with him even though we needed another Spider-Man like we need another Iron Man. He gets a solid B. Very true! His head movement is definitely lacking. He seems a bit more muscular than I would like. Surely Hasbro has a thiner body to use? Jonny Storm, perhaps? Either way, still a decent figure, though I would say that the MU version is better. Johnny Storm is too tall. This was the right choice for the height. 6 inch will always own 3 3/4! Don't bring your tiny puny MU to a Marvel Legends party! Yup, this figure was shown at SDCC. I wonder how long it will take to reach the US. needs locks or braids as a hairstyle oherwise hes absoulutely perecto!!!!!!!!!!!!!!!! !